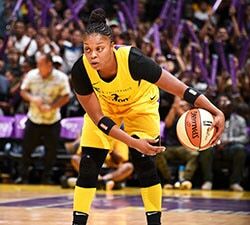 UNCASVILLE, Conn. (July 9, 2018) – The Connecticut Sun announced it has acquired Layshia Clarendon and a second-round pick in the 2019 WNBA Draft from the Atlanta Dream in exchange for Alex Bentley. A member of the 2017 WNBA All-Star team and 2017-20 USA Basketball National Team Pool, Clarendon has collected 1,237 points, 522 assists and 486 rebounds while appearing in 174 games with 88 starts. 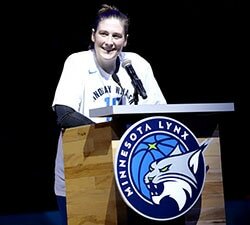 In her sixth WNBA season, she has played in 18 games with four starts. Last year, the 5-foot-9 guard joined Sue Bird, Ticha Penicheiro, Courtney Vandersloot, Teresa Weatherspoon and Nikki Teasley as the only players in WNBA history to record 200 assists in a season. Her 226 assists were a franchise record and tied for the third highest total in league history. Clarendon was originally drafted by the Indiana Fever with the ninth overall pick in the 2013 out of Cal after leading the Golden Bears to the first Final Four in program history, averaging 16.4 points and four rebounds per game. Bentley was acquired from Atlanta in a three-team trade involving the Washington Mystics on March 12, 2014. She appeared in 143 games with the Sun, making 98 starts. This year, she came off the bench in all 19 Sun games, averaging 10 points. 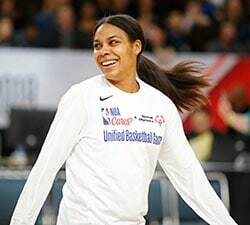 ATLANTA – The Atlanta Dream traded Layshia Clarendon and a 2019 second round pick to the Connecticut Sun for Alex Bentley, the team announced Monday. Bentley, a 5-7 guard out of Penn State, was originally selected by the Dream with the 13th overall pick in the 2013 WNBA Draft and then traded to Connecticut before the 2014 season in a three-team swap. A sixth-year pro, she has played 19 games for the Sun in 2018 and is averaging 10.0 points, 3.2 assists and 1.4 rebounds in 21.7 minutes of play. The veteran is a proven scorer in the league and will give the Dream another threat from the three-point line. She has career-averages of 11.0 points per game and has knocked down long distance shots at a 30.8% clip. The Dream included the Sun’s original second-round selection acquired in a 2018 Draft Day trade with Connecticut for Bria Holmes. Clarendon started four of 18 games for the Dream in 2018, averaging 4.3 points and 1.7 assists in 17.3 minutes per contest. She was acquired by Atlanta prior to the 2016 season from the Indiana Fever. “I want to thank Layshia for her time and commitment to the Dream organization and wish her luck in Connecticut,” Collen said. Atlanta will travel to Washington D.C. to take on the Mystics Wednesday inside the Capital One Arena beginning at 11:30 a.m.